These small ships serve thousands of small harbors all around the world. 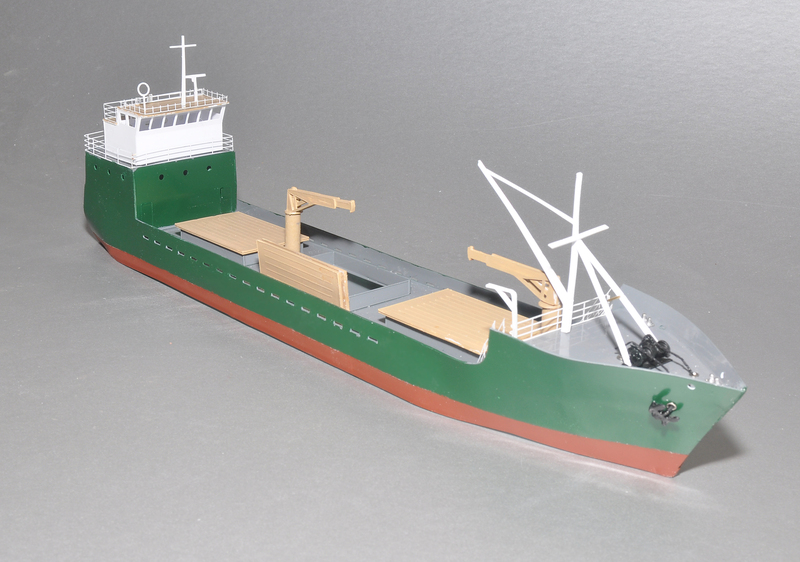 This model is based on the dimensions of a small freighter based in Juneau, Alaska. It is 180 scale feet (54 m) long, with a beam of 28 feet (8.5 m). The model is thus 13.5 inches (343 mm) long and 2.2 inches (54 mm) wide. Height to the top of the navigation bridge, minus antennae, is 2.8 inches (72 mm). The three hatches can be modeled open and stacked, or closed. There are two main hydraulic cargo cranes, plus a forward long-reach post and boom. Custom photo-etched brass railings and stairways, custom-made windlass and rear winch, lifeboat, davits, anchors, bitts and other small parts fill out the kit. The gunwhales are raised just as on the prototype. This is an easy kit to build. Kit prices is US $99.00 plus shipping. A basic built-up model is $450 plus shipping; a superdetailed built-up model is $650. 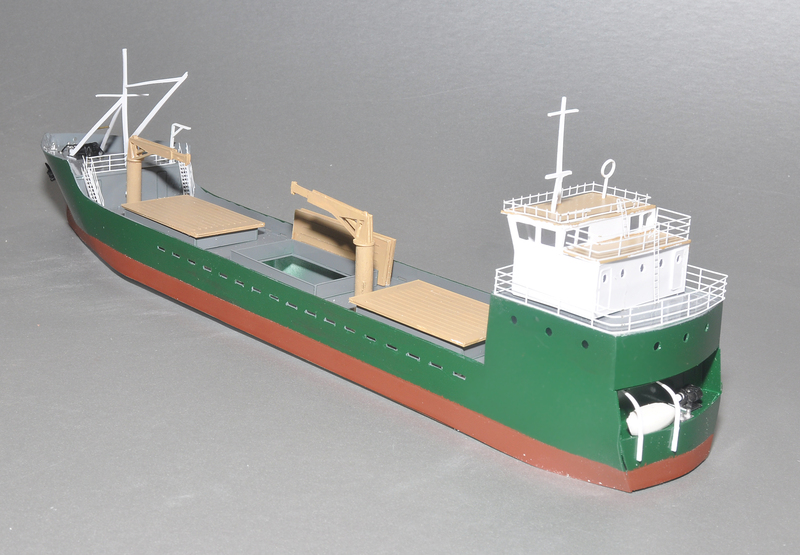 This entry was posted in N Scale Ships. Bookmark the permalink. How do you order one of these kits? At the present time, contact me at peterknolan@gmail.com to work out details. On-line ordering is coming! angled part of the stern.